Thank you for taking a moment to read this. I want to talk to you about my experience with eating disorders and how I’m helping to spread a positive message to young women who are affected by the illness. My auntie suffered from anorexia nervosa since she was just 13 years old, and sadly the illness took her life in her late 40s. Having experienced a loved one suffer first-hand, I knew that I had to do something to help erase the stigma attached to eating disorders and those who the illness affects. After launching One Nine Eight Five 7 months ago, I’m finally in a position to give back by donating a percentage of my profits to the UK’s eating disorder charity Beat. I am campaigning for positive change – will you help me on my journey?! Eating disorders are serious mental illnesses and come in various forms, including anorexia, bulimia and binge eating disorder. They can be deadly. It affects a person’s thoughts, feelings and emotions as well as having a physical impact and it comes in all shapes and sizes not everyone affected will be underweight. It is estimated that 1.25 million people in the UK have an eating disorder, and when you include the friends and family of those sufferers that figure jumps to a staggering 5 million. The condition can affect anyone at any time, but girls and young women aged 12-20 have the highest risk with a shocking 62% of symptoms developing before the age of 16 and 42% before the age of 20. My auntie fell into this group and developed the illness from peer pressure to look and be a certain way. Over time this turned into anorexia nervosa. Given my auntie’s story I am focusing my efforts on raising awareness of the dangers of peer pressure and social media – I think everybody is beautiful no matter if you are short, tall, skinny or curvaceous. I hope that by talking about these issues it will help overcome the stigma and shame many people feel about eating disorders, making it easier for them to accept the treatment and get the support they need to beat these illnesses, which is why I’ve stepped in to help spread the word. Anorexia is actually the rarest eating disorder with 10% of cases, despite the small percentage of people suffering with anorexia in comparison to other forms of eating disorders, it has the highest mortality rate of any mental illness. Whilst anorexia is usually the easiest illness to spot the more common forms like bulimia and binge eating are much harder to notice as people are rarely underweight. The physical signs, like losing weight, come a long time after the psychological and behavioural ones. We need to learn how to identify these psychological signs sooner so that people can get treated early. Once weight changes are apparent, the eating disorder will most likely be highly developed and engrained. The number of people seeking help and treatment has increased over the past 20 years, but it isn’t yet known whether the illnesses themselves are becoming more common. Competitiveness, perfectionism, control and low self-esteem form some of the key personality traits that increase the risk for eating disorders. People with eating disorders often judge themselves very harshly and are constantly comparing themselves negatively with others. They typically feel they are not ill enough to deserve treatment – even when they are seriously unwell. They can have a dangerously distorted body image which can convince them they are a vastly different weight to what they actually are. This distortion only affects their perception of their own body – they are able to accurately judge when others are underweight or ill.
Social media doesn’t directly cause eating disorders – these illnesses are complex conditions – but social platforms can greatly influence attitudes, beliefs and actions, especially on the lower age of the spectrum where children reaching puberty are far more susceptible to succumb to peer pressure and feeling the need to fit in. Given that weight and looks are often topics of interest throughout media journalists, broadcasters and social media users have a huge responsibility to not glamorise the subject. Media reflects and amplifies our social and cultural environment and it is one in which body image and perfectionism are highly prized. The growth of a celebrity culture where people are either idolised for their perfect bodies or else criticised for their physical failings creates a powerful influence that is unhealthy for many and toxic for a vulnerable few. Being surrounded by images of hyper-perfect bodies when one’s own view of their body image is distorted by a mental illness just reinforces the perception that your body doesn’t fit into the norm. 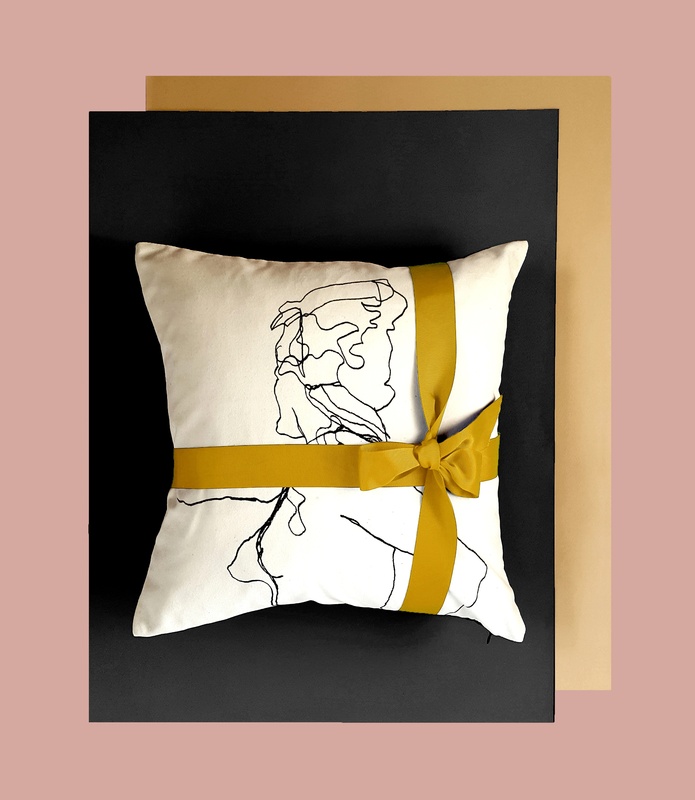 To help embrace the idea that everybody is beautiful I decided to create a limited edition collection entitled Woman Collection, comprising of a cushion, throw and print. The design is a line drawing of the female form celebrating the beauty found in every woman with 15% of the profits from this collection go directly to Beat. This collection is extremely special to me as the image was drawn by my mum – my aunties sister. I decided to support Beat because it provides training to help GPs and teachers spot the early signs and symptoms, and empowers them with the knowledge to support someone who is unwell. They have helplines and online support groups, giving sufferers and their loved ones a place to feel listened to and supported without being judged. This is only possible because of fundraisers like you and I. Sufferers face an average of 176 weeks before seeking help – 91 weeks before realising they have an eating disorder, 58 weeks between realising and seeking help, 11 weeks between their first GP visit and referral, 8 weeks between referral and assessment and 8 weeks between assessment and start of treatment. That’s over three years! Help make a difference. Share our message and challenge the stigma associated with mental health issues. The sooner someone gets help the faster they can recover, lessening the impact on their life, family and future. Eating Disorder Awareness Week runs from the 26th February – 4th March, during this time Beat will be running their own campaign, ‘Why Wait’ and asking people to ‘Sock It to Eating Disorders’ to raise funds for the charity, for more information click here. I will also be campaigning during this time and up until International Women’s Day on the 8th March. My campaign will be running across social media platforms Instagram, Twitter and Facebook, illustrated by the fabulous artist Anita Robinson. I hope that together Anita and I can boost awareness of the increasingly detrimental effects of social media on young people. Please help us spread the word by reposting our imagery during and after the campaign. To read about what we will be up to during Eating Disorder Awareness Week stay tuned for our next blog post.